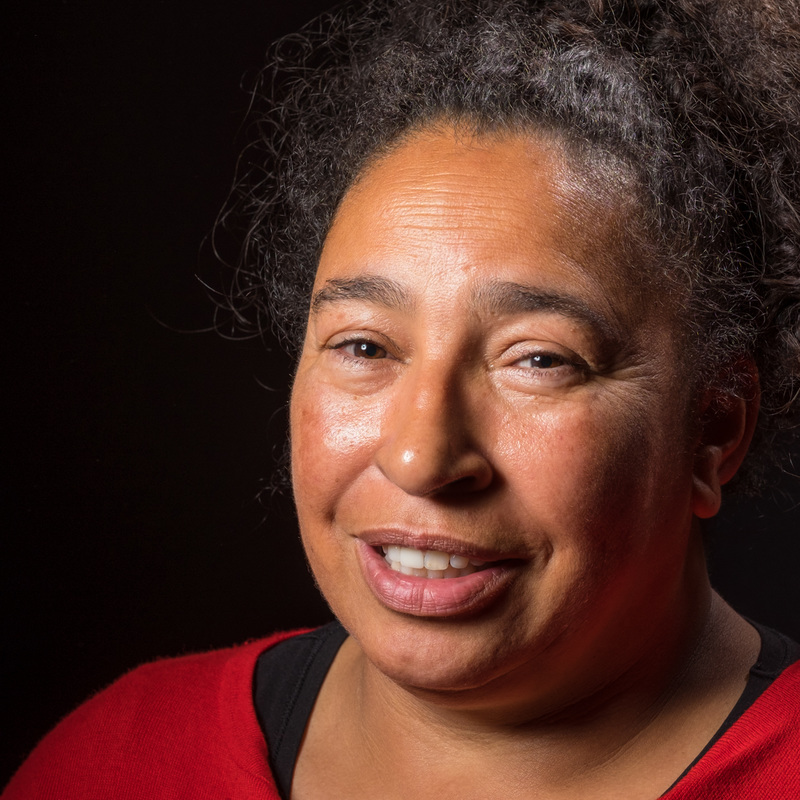 Karen is of dual heritage being both Jamaican and English but she has struggled to find acceptance with this identity within herself and by other people. She talks about her difficulties growing up with the responsibility of being a carer and having that take precedence over her personal battle to find her own sense of place. It was not until in her late 40s that her journey into self acceptance began leading her to working on the subject of identity within the local community. JW: So Karen – I know you, obviously, but the people listening in – may not know you, so can you introduce yourself to tell, tell us who you are, your full name and your connection with Africa? KO: My name is Karen Okra, - my middle name, two middle names actually, Ann Ama, so it’s Karen Ann Ama Okra and Ama means I’m a first girl born on a Saturday, and my connection with Africa is – my father is of Jamaican descent and so he most probably more likely have been a descendant of slavery. JW: OK, so have you ever looked into that, have you ever looked into your family ancestry? KO: I have to talk about identity, I always struggled with who I was growing up, ‘cos I was brought up in – an area of Hull which was predominantly white. JW: Can you give us a date for this? KO: I grew up on Longhill - from the age of ten and I’m 55 on the 7th October in a few days’ time, and so growing up on Longhill I have some, I have a lot of really good memories but I also have memories of I struggled a bit with who I was in terms of my colour, it was an issue, my colour was an issue for me growing up because I was about one of – two families of African descent and of – dual heritage, and probably one of three families of a single-parent background. JW: Were you born in Hull? KO: I wasn’t born in Hull, I was born in London and we moved to Hull when I was eight months old so I can say I’m Hull. JW: Yeah, proper Hull. So tell me something of your earliest memories then, of growing up on Longhill, say, those first ten years? What, what was your family life like, what was school life like? KO: School life was really, really, really – I enjoyed it, the lessons I always struggled in terms of like any other child sometimes, you know, I wasn’t , I wouldn’t say I was the brightest of pupils. I struggled – you know, sometimes with reading and writing I always had to work hard to achieve, but one of the things I was, sort of, really aware of and which I still, you know, I still get that feeling, I remember of feeling really different to everybody else and it wasn’t necessarily in a good way, do you know? JW: What sort of age did you get that awareness? KO: I think it’s all the way through junior school, ‘cos then it used to be the junior school, you went to juniors from the age of nine ‘til thirteen, and so all the way through junior school I really knew I was different to everybody, you know, to everybody else and I think other pupils made you feel like you was different as well, and even in the school, you know, in the school you had teachers who – especially when I got to senior school – there was a teacher I remember, Mr Fox, he was a really lovely teacher, and he said, he did say it in a good way, but he said “Oh, Karen” you know, in assembly he’d brought some African shields and African, you know, objects and he said “Karen, can you stand up?” and you know, you know “Karen, you know is probably from, you know, her family is from Africa” and that to me was just singling me out, do you know, he did it in the most nicest way but little did he know that, how I was feeling that people reminded me I wasn’t white. JW: Yeah. You mentioned that was secondary school, going back to junior school and your friends and the like - what was the sort of feeling, the awareness of your friends? KO: Oh, they always used to make jokes, being different and being of black colour skin, not that you always want to focus on skin colour, but that was a big thing for me and – in terms of myself accepting – accepting my own self for who I was, do you know, it was a problem for me because I was reminded that I wasn’t white, and so people used to joke about, about, about that and so I used to make jokes myself as well, you know, so that I could make friends, so to be on side so I didn’t get either picked on or, do you know, or I felt part of a group. JW: So, you mentioned right at the beginning of the interview other families on the estate? KO: There was one other family and they was from – actually the dad was Jamaican, but at the time I’ve got quite a bit of a story to tell, at the time, who I thought was my father, you know, my father at the time – who I called my dad, who I just used to see now and again ‘cos he wasn’t in Hull, he was studying to be a barrister and so he was only in Hull for some time, that’s why my mum came here, he wasn’t my real father and so he was from Ghana, so growing up, do you know, I used to say my dad was from Ghana, and I felt a little bit proud in a way, but then I was always reminded, you know, do you know, that, he wasn’t, he wasn’t British, he wasn’t from Hull, do you know? KO: And you know that it wasn’t that I was born in London and came to Hull when I was eight months old, I was reminded that you’re not from Hull you’re from Africa, do you know, if you’re black you’re from Africa. JW: How much did that shape you and influence you in, say, your formative years as a teenager? KO: I hated being, I hated that, I hated being who I was and I found it hard to accept who I was, I used to wish, and I’m not just saying this, I used to wish and cry, to wish I was white. It was tough but I also was from a family who, you know, I was a young carer from the age of ten, so I’m sure that that had a lot of things – to do with how I was feeling and influenced how I was feeling a little bit, a little bit of insecurity a little bit of, do you know, it was hard and tough. JW: Have you got any brothers and sisters? KO: I’ve got two sisters younger than myself. JW: Two sisters, yes. Did they have the same sort of experiences? KO: Yeah, yeah they did as well – do you know, we had it tough, you know, being from a single parent background, being our mum was white, our mum was in a wheelchair, when I was thirteen, my mum was in a wheelchair, she had Multiple Sclerosis and so we didn’t really, a lot of the time we was, we was struggling as young carers and so we didn’t always play, life was serious for us, serious in the fact that through, you know, your ethnicity but also because your mum was disabled, so, you know, when we did have time to make friends and play out, d’yer know, we call it playing out, that’s my Hull accent, it was, it was tough, it was tough to being accepted, I always struggled with, I always felt there was a missing jigsaw even up until about six or seven years ago, do you know, and I started to get to know the black – Afro-Caribbean, African background, do you know, the groups and starting to think I want to know about, you know, you know – different cultures. JW: Going back to your teenage years – what were your hopes and aspirations for your future? JW: So you felt you were having a really tough time? Your sisters were having that same tough time. Did you ever sort of discuss together where you, you know, what you might do together in the future? KO: Do you know why we didn’t think about the future because we was too busy dealing with what was happening, and like I say, do you know, there was two things, one – that we were young carers, we were struggling – a lot of, you know, people from any back.. – you know, ethnic minority background, they maybe had a sense of family in a way, but we didn’t have that other than we was looking after our mum, I was frightened that she was dying all the time because I didn’t understand what Multiple Sclerosis was, so we didn’t maybe have the talks and the comfort and things like that, and the opportunity to talk about how we was feeling about being accepted for your colour and – and where you come from because we was too busy dealing with our situation. JW: When you were able to - get out of the house and to explore something of Hull, perhaps with friends or even by yourself, what did you get up to, how soon did you get into, say, the cultural side of Hull? The arts side? know, the music then, House Music, music did it for me. Really did it for me. JW: Is this the 1980s? KO: Yeah the late, the late 80s, early 90s, it was brilliant and I really felt part of something, it was a time of my life I started to enjoy music, I had something in common with other people, like-minded people, who, that I can remember there was a boy – at school, I’ll only say his first name, I’m sure he wouldn’t mind me saying his second name, but they called him Peter and when we was at school in senior, people used to be mocking him and calling him and saying about him being gay and camp and everything, and then we didn’t see each other for years and then we met up in the old Silhouette Club and we was talking about how both of us experienced, do you know, like name-calling and, and – and how, although we enjoyed our school days, there was a lot, there was good times, there was a lot of upsetting times as well, and sometimes when you felt like you didn’t want to go out of school because people were going to wait for you because of your identity and who you are, sort of bullying you, bullying, but I suppose everybody’s been bullied at some time of their life, just so happened he had it, you know, because you know he was, you know, he was gay. JW: When did you begin to feel proud of your identity? KO: Do you know what made, why I say that, because I’d always struggled and, and I’ve always felt something growing up and, you know, as you’re older you think well, do you know, it doesn’t bother me now, as such, but I felt there was something missing and I’ve been reminded on occasions, growing up, I’m not white, and then six years ago I thought finding out what my other, sort of, my heritage is, I thought I’d be accepted and I was reminded I wasn’t black and I thought, do you know what, I’m sick of battling with this, I’m sick of, do you know, it don’t matter who I am, do you know, this is who I am, we’ve all been exploited, we’ve all had to conform and it’s more than, for me, it’s more than culture and diversity, it’s about identity and I thought “I’m sick of people”, you know, ”putting me into a category and labelling”. It’s not a sob-story, it’s just how I’m feeling, and now I’ve come to terms with that and I’m proud of my identity. JW: So how would you describe your identity? KO: I’m me, I’m Karen and it’s my journey, my life journey, because of my journey it’s made me who I am and I do, I’m a bit more conscious of other people’s life and plight, or even just who they are, do you know, I’m not saying I’m perfect, but I do try to think, sometimes, well not everybody’s bad and it’s not necessarily their fault, there’s a person there, there’s good and bad in everyone, but I’ll always push for the cause as well, I don’t like injustice, and I know that I do a lot of things and people think “Oh, Karen, she knows a lot of people, Karen does”, I will always push for that, but Karen, the more personal side of Karen, I’m a bit, I am a bit, I know it sounds silly but, I am a bit more reserved and just trying to appreciate my own self. JW: Are there any people who have been a major influence on you? KO: I like like-minded people who in their own way challenge injustice and I think if there’s people doing, doing that like I know you know a person in this room was doing you know doing something like that to the cause. I will always you know look up to people like that. I think sometimes we focus too much, I know we are U K City of Culture in 2017 but I think the legacy is that we are more than that. It’s not just in, in a, and I think people will tell you that, that are part that. It’s about who we are, who shaped us in the past. We shouldn’t forget those people that have paved the way and who we are now, where we are now and where we are going to be in the future and I think that as long as there’s like- minded people like that who are- who all think like that and are pushing that. We’ve got to think- to think outside the box a bit. JW: So, if you can cast your mind back at least a decade, I don’t know, to how Hull was say in the 1990s - how would you have describe Hull then and what comparisons or which different descriptions would you give Hull now? KO: I think that Hull in the time - time I said that I really like the music and everything. I found sort of - I felt that music brought people together. I felt that like it was somewhere I was accepted but I wouldn’t necessarily say the city was like that. I think we have got a long way to go. Brexit, I don’t think people we all, I think a lot of people would agreed that they - a lot of people didn’t realize what Brexit meant. I knew what Brexit meant because I think if you are a minority in Hull I think you’re more - you’re more aware, you have a sense of sort of things that are underlying – The underlying things that are there, you know, intentions and I think that out of ignorance – I even know people who are doing a lot of community work who we think a lot the same and we’re doing a lot of the same work. One person in particular she said to me “Karen” she said “I” she said “I voted Brexit” she said “I didn’t even realize until you said how that would affect and how it would affect us as a country - as a community, as a city in the country”. And but I think you’re more – I don’t know, you’re more aware of what’s happening and for the first time in my life, in my voting life, sorry, the first time in my voting life I was queuing up to vote. I felt vulnerable and I don’t want to say that I want to say me or, or just take that it affects me personally. But it made me think that, you know, people are looking at me and you know it was real surreal. I thought I was, I was looking, I could see myself in the queue voting and I thought do you know this is really, I’m a bit scared and frightened in one way the fear of, of what people that you know as a result of that and what’s going to happen. Now some people might think well it’s not as bad as you think. This I mean until you walk in somebody else’s shoes how do you know if you’ve not been somebody who has, had to, who’s been a minority. I feel we’ve gone back about thirty years. We’ve got a lot of work to do, d’you know, in terms of working together and engaging with one another, yeah. KO: Do you know something, you’re saying communities have been, what was your words then? JW: Well sort of broken, more distant. JW: Do you think Hull was particularly bad for that? –. When I was doing youth work in 2007 we agree that was probably where I met you first. JW: I was up on the top end of Holderness Road, Kingston Wesley Church there – right on the corner or the intersection of three or four different estates Bilton Grange, Preston Road, Orchard Park and the like and I found – certainly within youth work a real territoriality. That really surprised me. So when in Hull I find there isn’t just this East West - divide of the city. I find Hull very, very parochial. KO: It can be and it is the thing is you’ve got to meet people where they’re at whatever that may be. The message you want to get across whatever the issue or challenge you got to see people for who they are and meet them where they’re at. I say it again because you would not and I’ve said it a few times to people, you would not knock on somebody’s door, walk in and tell them what to do. For me in the project, I’m developing a project called Hull Identity, and it came about because of some of the things that I have said, you know, spoke about. It’s about creating a vehicle or a platform where you bring two concepts or ideas together that you wouldn’t normally put together. So if you’re talking about you want to raise awareness of – trafficking or something like that then the Venture Smith Challenge Cup which I did with, what I organised was an example of that where I brought East Hull and West Hull under 14s rugby together. Now if you’re going to be doing the West Venture Smith Challenge Cup Event. Venture Smith was an African slave who bought himself out of slavery for I think £71 and a few shillings, which is the equivalent of over a million pounds today. You want to send the message out to people that – what happened in the history can still happen now and about how we are and who we are and you know in terms of identity and coming together. Then that would be a real good way of doing that d’you know in terms of you’ve got people talking rugby and that’s the thing that they live and breathe. So Venture Smith Challenge Cup in West Hull Rugby Club the two teams who were opponents on the field, bearing in mind they’re friends off the field, if you ask them what are you doing this weekend “Oh, the Venture Smith Challenge Cup”. “What’s that?” You, you’re creating a platform or a vehicle to send that message out that what happened initially is still happening now and you’ve got 500 people tuned in. Now growing up there weren’t – there wasn’t opportunities for me growing up in - in primary or junior school where we played sport like that and rugby. We did do sport but it wasn’t something which we can now say this city is built on sport and so we’ve got opportunities there now. Though, it was like you go to school and go home. Schools are more community now. I think education and learning is a really good way and young people. JW: Where do you want to be in 15, 20 years time, Karen? KO: Well I want to be breathing. I’ll still be fighting- fighting the cause, fighting, challenging and trying to make a difference. As long as I’m breathing I’ll always feel like I’ve got a purpose and I think one of the things is, is ‘cos I’ve been in a caring role, I was in a caring role for many years and I think that’s what I feel and I hope that’s what I do now in the communities. I do a lot of voluntary work. I feel that I’ll still be doing that in some sort of way and I don’t want to live my life - trying to justify my identity. I don’t want to do that. If I could wave a magic wand and, and God answers my prayers I wouldn’t want a, I wouldn’t be in 15 or 20 years time having to challenge the injustices for everybody else but I know that we’re not in a perfect world so I’d like to think I’m still up doing that and I’d like to go to university. I think I want to be about 75 to 80 trying to do a really big piece of research on social and, either social injustice or some social. You know it’s always around people, I’m a people’s person and I’m beyond the black and white thing, but yeah. JW: Karen, thank you very much.